The proposed EV charging program enjoys widespread support. The Maryland Public Service Commission is currently deliberating on a January 19 filing that proposes the creation of a “Statewide Electric Vehicle Portfolio." With 24,000 chargers, it could become the second-largest EV charging network in the country. “I look at this as a huge -- and I don’t want to call it a first step -- but a huge step forward,” said John Murach, manager of energy programs and services at Baltimore Gas and Electric Company (BGE). The $104 million program brings together a comprehensive range of 14 signatories, including utilities BGE, Delmarva Power & Light, Potomac Electric Power Company (Pepco), and Potomac Edison; environmental groups including the Natural Resources Defense Council and the Sierra Club; and EV-charging companies such as Greenlots and ChargePoint. That collaborative group got together to work on EV initiatives as part of a larger commission proceeding on grid modernization. The final proposal is one that both EV-charging companies and utilities say should act as a model for further state charging plans. Maryland is one of eight states signed on to the Zero-Emission Vehicle Memorandum of Understanding, a coordinated action to boost the adoption of EVs. In 2013 the state committed to a target of 300,000 zero-emission cars on the road by 2025. The year before, however, it had only 609 electric vehicles. At the end of June 2017, it had 9,400. In order to see continued growth, Maryland will need the infrastructure to support additional cars. The potential program includes chargers at residential, multi-unit, non-residential and public sites. It also leaves room for a variety of ownership models, both site-host-owned and utility-owned, as well as options for the site host to select its vendor. The utilities have also included plans for whole-house time-of-use rates to encourage off-peak charging. Moving forward, utilities said they hope to develop standards for EV-only time-of-use rates using smart chargers instead of second meters. According to those involved, crafting the plan worked because there was an “open, collaborative stakeholder process,” as Schatz put it, and it engaged a diverse group of participants from the beginning. In California -- the state with the largest charging program -- Pacific Gas & Electric faced delays on its charging program due to pushback from companies like ChargePoint that initially said it didn’t consider third-party interests. Murach said the utilities involved in the Maryland proposal want “to move this ball forward,” but ultimately want to engage a variety of parties and partners to build out a complete EV network. Beyond infrastructure, the program includes education and innovation components designed to spur further EV adoption and development. The budget includes $5.1 million for customer education and outreach including events, social media campaigns and community presentations. BGE, Delmarva and Pepco also earmarked over $12 million in innovation grants. “This is not just about infrastructure,” said Rob Stewart, manager of smart grid and technology at Pepco. According to an analysis included in the filing, the benefits will outweigh the expenses footed by ratepayers. Peak monthly impact for residential customers comes out to $0.35 for BGE, $0.34 for Pepco, $0.42 for Delmarva and $0.25 for Potomac Edison. In BGE service territory, if EV growth meets Maryland’s 2025 targets, charging revenues would be twice the residential revenue requirements. A 2016 report on the annual benefits of EV adoption, in line with the state’s long-term greenhouse gas reduction goals, would accrue to $230 per plug-in vehicle by 2030 and $515 per vehicle by 2050. And then there’s the environmental and political impact. “Maryland sits right on the Chesapeake Bay, and clean air and water are concrete goals,” said Murach. Murach noted that Maryland sits in the middle of the bustling transportation corridor between Washington, D.C. and northern metropolitan areas such as New York City, Philadelphia and Boston. Though Maryland is among the country’s smallest states in terms of land area, it’s population-dense. 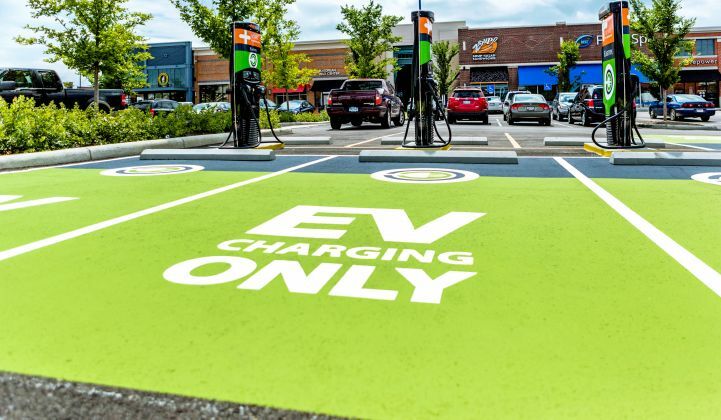 The program takes into account an outsized flow of cars through Maryland’s center, according to Murach, but also considers lesser-trafficked areas of Maryland that could see an expansion in EVs in the future. A spokesperson for the Maryland PSC said the commission is now reviewing the petition, but declined to give details on whether the commission will open a docket on the proceeding or when that might happen. Stakeholders hope a schedule will come soon. They plan to commence the project’s five-year rollout by July of this year. In the short term, though, they’re celebrating. When I reached ChargePoint’s Schatz by phone, he was lurking in a hallway at the Texas PUC and apologized for his subdued demeanor. “If I were out in the open, I’d probably be screaming right now,” he said.